Beef, brown sugar, pineapple juice, hot & spicy banana ketchup, lemon lime soda, soy sauce, salt, garlic, pepper. The first thing I taste from the surface of these pieces is a light sweetness, and a very faint spiciness. The chewing brings in that banana ketchup flavor, with the spiciness ramping up just a touch. The soy sauce is lightly noticeable. The sweetness continues, with a light bit of black pepper, and there's a very light natural meat flavor. For being marketed as a "Spicy Tocino" beef jerky, I'm not sure. It's not really spicy. I do pick up traces of spiciness, but not enough to tout and advertise. As far as the Tocino is concerned, I'm not familiar enough to judge. Otherwise, the flavors that seem to define this jerky primarily is that banana ketchup flavor. The banana is discernible, not heavily, but enough to identify. The sweetness has the next-most strength, with the soy sauce coming in after. There are faint traces of the pineapple, and just a touch of spiciness and black pepper. 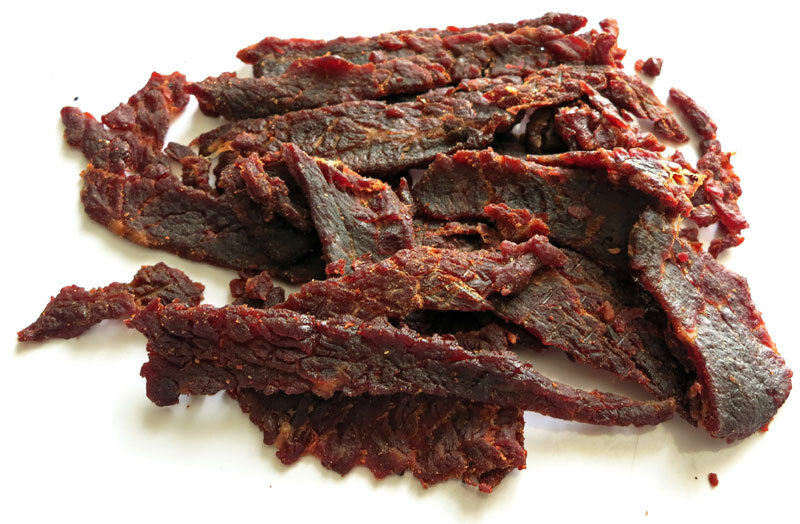 This jerky almost comes off as a teriyaki variety with its thick sweetness and light soy sauce, but clearly differentiated with that banana ketchup flavor. The spiciness is low, perhaps registering a mild-medium on my personal heat scale (level 2 out of 5), with some of that heat coming from the black pepper. The level of saltiness feel low. These appear to be slices of whole meat, sliced into strips I various lengths, and sliced medium thickness. This is a slightly moist jerky with a semi-moist surface feel. Biting off pieces seems moderately easy, while chewing seems easy. The chewing texture starts out with a fair amount of initial chewing resistance along with a little bit of a "plastic" feel you find in some of the major brands of jerky. It has some of the gumminess you find in heavily sweetened jerky, but a little bit of a meaty chew, though not like steak. Some pieces have small bits of visible fat, some of which add a beefy flavor. I don't see any gristle. The chewing reveals a light bit of stringiness with a low level of unchewable wads of tissue. In terms of clean eating, my fingers pick up light levels of stickiness, but not enough to warrant a licking and wiping before touching the keyboard. 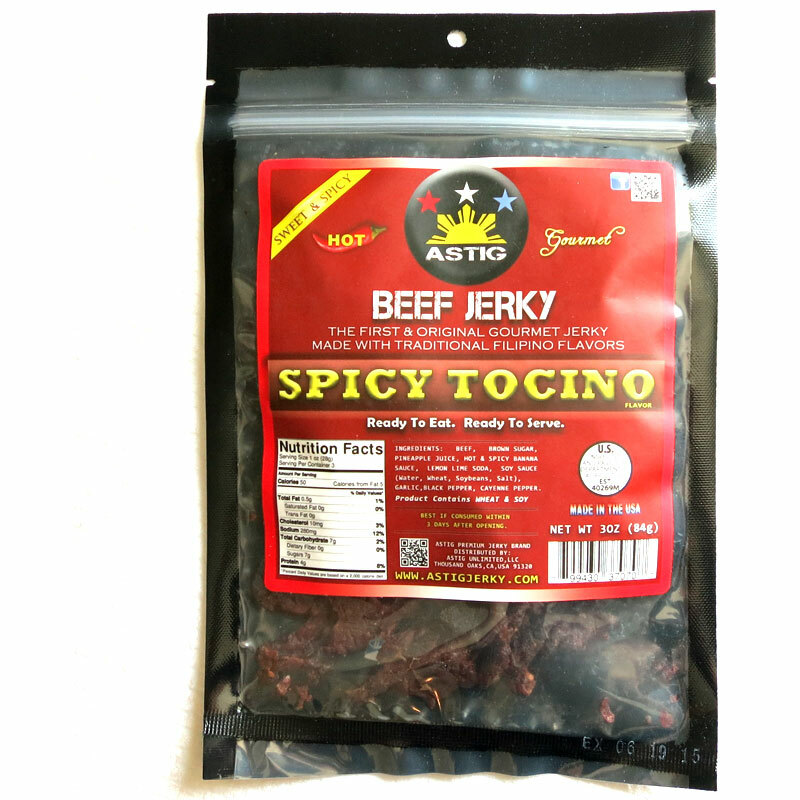 Astig Jerky sells this Spicy Tocino variety from its website at a price of $36.00 for a six-pack of 3oz each. With shipping of $3.00 to Southern California, that works out to a price of $2.17 per ounce. 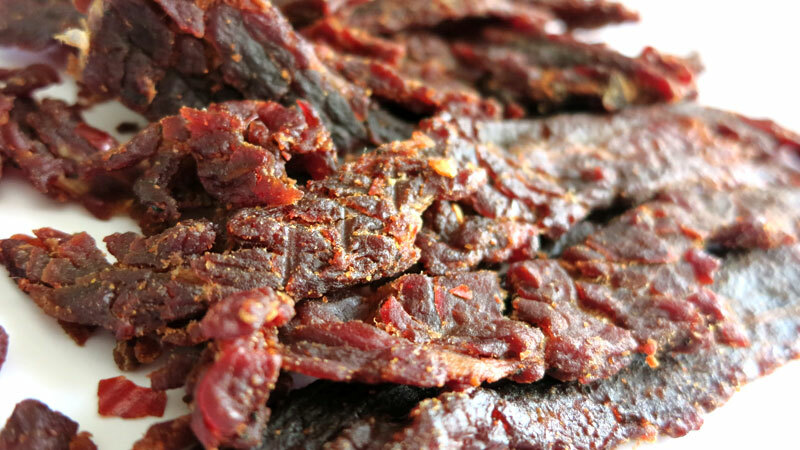 For general jerky snacking purposes, at the $2.17 per ounce price, it's a decent value. I'm getting an average amount of snackability from an interesting though satisfacgtory flavor, decent meat consistency, and decent chewing texture. Compared to other brands, it tends to offer similar flavor, similar meat consistency and chewing, for a similar price. This Spicy Tocino Beef Jerky from Astig Jerky offers the unexpected flavor of banana with a good deal of sweetness and soy sauce, and a light bit of black pepper. It tends to taste more mild than the name might suggest, generating only a light bit of spiciness. It actually reminds me of teriyaki beef jerky, with its heavy sweetness and dashes of soy sauce, but adds that unexpected banana flavor. The chewing tends to be a little gummy with a light initial plastic feel, but eventually takes on a meaty chew. Compared to Astig Jerky's "Adobo" variety I reviewed last week, this one is not as flavorful, not as spicy, though it tends to have a little better chewing texture.